Axum or Aksum is a region in eastern Africa, south of modern Egypt in what is now Eritrea and Northern Ethiopia. Aksum was home to the Kingdom of Aksum, a kingdom which existed from approximately 100 AD to 940 AD. 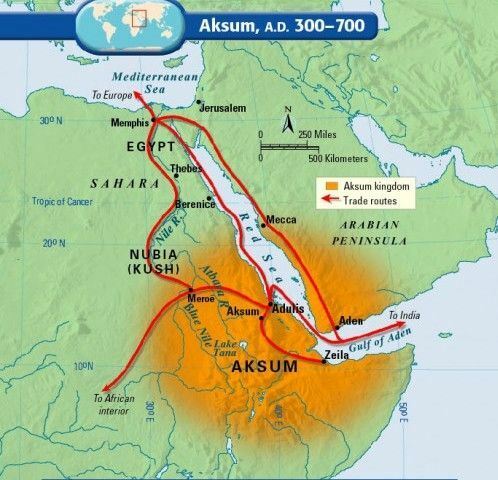 Aksum was a major player on the commercial route between the Roman Empire and Ancient India. The Aksumite rulers facilitated trade by minting their own Aksumite currency. Around 356 AD, the area was converted to Christianity by Frumentius. The historical record is unclear, with ancient church records the primary contemporary sources.